Yesterday afternoon’s adventure had somehow shaken my confidence in cactus exploring by SatNav. ‘Good job too!’ I hear some of you say. But the positive was that we had seen another valley in quite some detail and knew that the one we were looking for lay between yesterday’s valley and the one that had NL 61 running through it. This morning I was going to tackle it a different way. I had the coordinates for the spot where we should leave the 61 and turn left for La Poza. When we left Iturbe and put these coordinates into SatNav, it again tried to send us through the Sierras. This time I thought of the Frank Sinatra song, and did it my way. The exit on the 61 was found exactly as I remembered it. S3066 was for a pair of (young?) 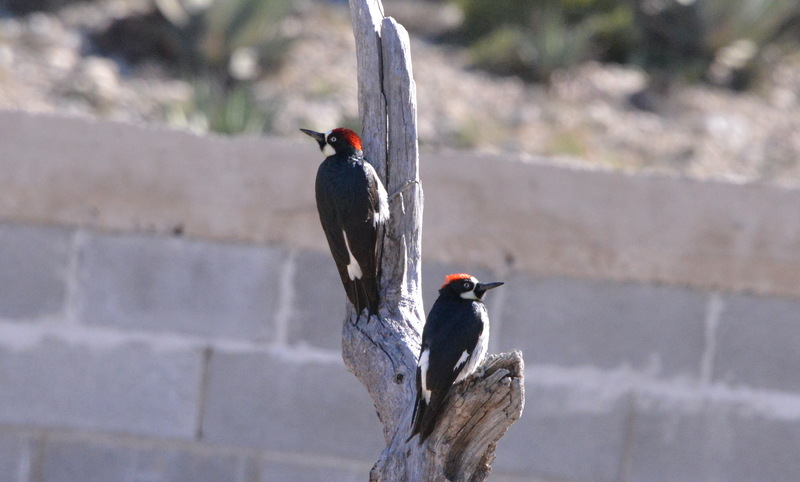 woodpeckers along the road. The track through Ejido La Poza ticked all the boxes, although SatNav made another attempt to confuse us. We ignored it until almost at the 2011 stop, when all of a sudden it knew where it was and where we should go. If only it were that simple. There were half a dozen canyons that were candidates to be the home for today’s target plants: Aztekium hintonii and Geohintonia mexicana. Cliff disappeared up one valley and Ian up another while I struggled. After a sedatory winter sitting at home in England to avoid the continuous rain, the recent activity was causing problems with sore feet, especially with the nail of my big toe that will probably fall off in the next few days. As any diabetic will know, it’s important to look after the body’s extremities and having seen my late father in law lose both his legs due to poor blood circulation / diabetes, I’m being very cautious. Initially I slowly followed Cliff, meeting him on the way back from his first canyon (S3067). Nothing found. While this location ticked a lot of boxes in my memory of my 2011 visit, I was looking for a large group of cacti, that at the time I thought might have been Thelocactus conothelos, but that this time the three of us decided that it had to be a Coryphantha – but which one. To confuse matters, a solitary look-alike, Neoloydia conoidea was here with flower colour matching what I had seen before. And then there were the Thelocactus buekii as seen yesterday and still in flower. All these plants were present but not how I remembered. I half formed a plan to walk back to the road and into another canyon when I remembered it was silly to try to do so without a drink (water!) – again it was a warm day. So, back to the car. Fortunately I had the one key. Ian walked up to the car just as I was about to get there. He had been up and down several canyons while following the contours of the hills alongside the track. He had come across a number of our target plants, more Geohintonia than Aztekium, some set back, almost along the track,. We decided to wait for Cliff to return and started to get worried as over an hour passed before we could see his yellow T shirt appear. We had been quite silly really, stomping off in various directions in our excitement of the cactus hunt, out of audio and visual contact while two of us had some past medical conditions that are fortunately under control, while the third is the age where we were struck by a heart attack, although he is probably a good deal fitter than we were at the time. Still – all’s well that ends well – we promise to do better in future. I photographed the following plants at these stops: Coryphantha sp. Mammillaria sp. 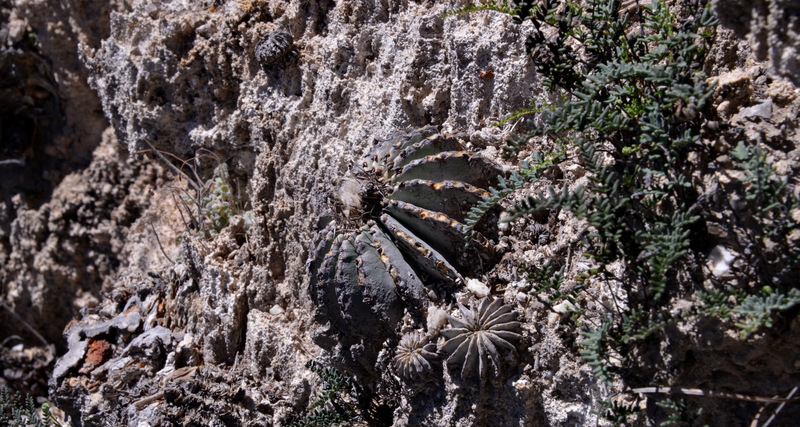 Neolloydia conoidia, Selaginella sp, Thelocactus buekii, Tillandsia recurvata, Yucca sp. and of course Aztekium hintonii and Geohintonia neomexicana. We took a look another km. or so along the track, but remembering the news items of car jams on the roads leaving Monterrey for ‘vacanciones’ (which one?) and remembering that as we left Iturbide after breakfast, that they were setting up staging for a concert / party on the plaza outside Posada El Carmen, it might be wiser to secure a room for the night first. Galeana was our first port of call where in 2011 I had stayed in one of three or was it four hotels around the Plaza. As we approached the Plaza, we could hear loud music – people warming up for tonight’s party here as well. So on to Rayones, where the Posada was locked up and the old boy at the only hotel in town said that tonight there were no rooms, but to come back tomorrow. Yes, sure! A quick look at maps and we decided on a safe bet – Montemorelos, on the main highway south of Monterrey. Another dramatic ride through the eastern end of the Sierra Madre Oriental, with views over the plains below towards the Gulf of Mexico. 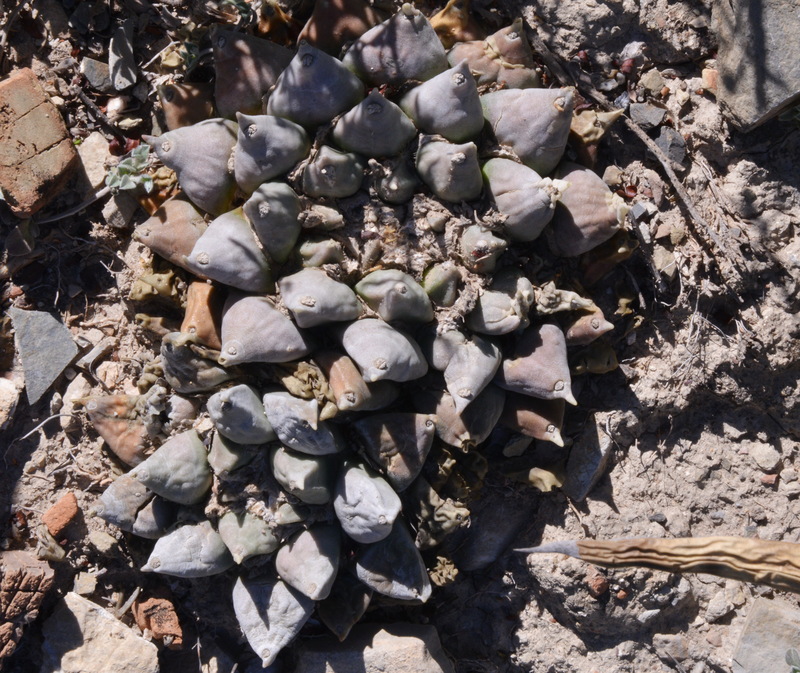 As Cliff steered the car down the narrow twisty roads, avoiding the stone fall that suggested a recent storm, Ian was still able to spot an Ariocarpus retusus between the shrubs on the side of the road (S3069). Good spot! A quick leg-stretch to take its picture and Ian found another Ario, a double header this time. It was still light when we found lodgings in the Alfa Inn hotel in Montemorelos, a clean and modern hotel for business folks on the road, rather than the local, Mexican style hotels that we had enjoyed in recent days.